Origin and Habitat: Distribution: southeastern Puebla and northern Oaxaca, Mexico. 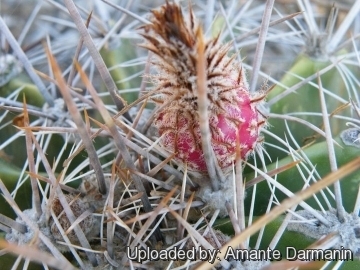 Habitat: Grows in dry limestone hillsides in the same area as Ferocactus robustus, and has the same associate species, but usually it is found on higher limestone sides. Description: Plant at first solitary, afterwards freely sprouting from the base and often forming great many-stemmed mounds up to 100 cm high and more than 2 m wide. F. flavovirens is similar to Ferocactus robustus, but it has larger and fewer stems with more numerous ribs and different spines. Stems: Globose to cylindrical, light or dull green, 30-40 cm, 10-20 cm in diameter. Ribs: 13 (rarely 11 or 12), acute, somewhat sinuate about 1-2 cm tall. Areoles: 2 cm (or more) apart, large greyish and woolly. 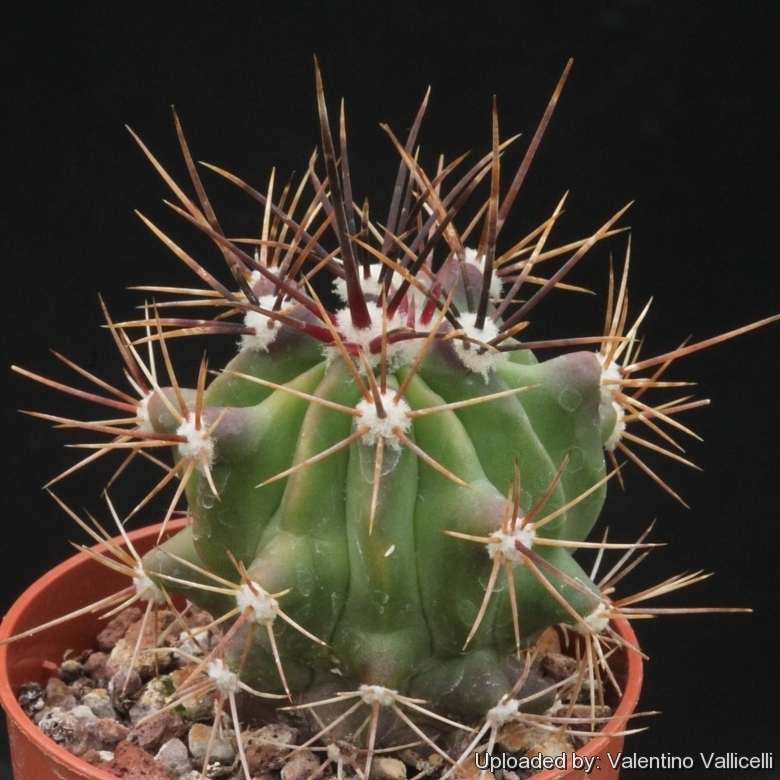 Spines: Light brown becoming grey as they age, needle-like. Central spines: 4(-6), radiating, stout, much longer than the radials up to 8 cm long, somewhat unequal, lowermost one longest, more or least stright and pointing downward. Radial spines: 12-20, radiating, upper ones sometimes lighter colored and bristle-like. Flowers: Borne on young areoles in the centre of the stems, funnelform, yellow to yellowish red, to 3 cm long and 2,5 cm in diameter. The flower-buds are globular with long liner imbricating scales ciliate margins. Fruits: Ovoidal, red upto 2,8 cm long, completely covered with long, brown, ciliate scales with bristle-like tips. Cultivation and Propagation: Slow growing to start but does well under cultivation. Suited for any rich, well drained soil in full sun throughout the year. Water during the aestival growth cycle (this plant need plenty of water) But needs to be avoided wetting the bodies of these plants while they are in sunlight. A wet cactus in the sun light can cause sun burning which can lead to scars or even fungal infections and death. In winter keep completely dry at 10°C, but can tolerate sporadic light frost (Hardy to -6°C).